Supernatural Tourism - Real Haunted Houses You Can Visit In The U.S.
Every town has their old haunted legends and haunted houses, however many of them you can only legally view from the outside. What's the point of a haunted house if you can't go in and have a look see for yourself? However, these days, especially around Halloween supernatural tourism is a lucrative business. Instead of going to fake haunted house this Halloween, why not try some of these real ones in your area? The Biltmore Estate, Asheville, N.C.
What place looks like it came straight out of the French Revolution and is more visited than Graceland? This place! More specifically, the Biltmore Estate in Asheville, North Carolina. Not only is this beautiful mansion supposed to be haunted, but it is a 250 room HUGE beautiful mansion to explore and prowl around. As the story goes, a Vanderbuilt widow (one of the richest families in this country's history) talked to her dead husband long after his death in 1914. People touring the mansion have often remarked that they have heard maniacal laughter, spotted a headless orange cat, and have been served champagne by a waitress who would then disappear. Regardless of if you spot any ghosts, this mansion is still a sight to behold by itself. The Amityville Horror House, Amityville, N.Y.
Green slime, black toilets, and swarms of flies—Oh my! This house on a luxury spot on Long Island inspired eight movies and a 2005 remake, as well as a slew of hoax conspiracies. For haunting fans who have mysteriously not heard anything about Amityville, it is the story of a house. The house that, from the street, looks like a smiling face. However, inside that house is where eldest son Butch DeFeo murdered his father, mother, two brothers, and two sisters claiming a demon had possessed him to do so. After the murders, another family moved in and experienced what is now considered one of the most extreme haunting in united States history. The house has had various owners, but as of September 2010 it is owned by David and Caroline D'Antonio for $950,000. They now open the house up for thrill seekers on Halloween for touring. The Winchester Mystery House, San Jose, Calif. The Winchester Mystery House, as it is now known, was the house of wealthy widow Sarah Winchester, of the Winchester rifle fame. Under Mrs. Winchester's daily guidance the house was under construction from 1884 to 1922 when the widow died and construction stopped. It is estimated that 500 to 600 rooms were built, but because so many were redone, only 160 remain. Why did she have continual construction on the house which included secret doors, staircases that led to nowhere, and doors that opened to nothing? Well at some point in her life, Sarah Winchester believed that her money and her house were being haunted by the ghosts of those killed by Winchester rifles. To appease them, she felt that she must continue construction on her house so that they wouldn't kill her. The house, now a tourist attraction, was built so insanely so as the ghosts couldn't follow her around in it. Now when visitors take tours, they are urged not to wander from the group as it can take hours to find your way back out. Not to mention that they might run across Sarah Winchester's spirit or one of the many that haunted her. The Little Bighorn Battlefield House, Crow Agency, Mont. The location of Custer's Last Stand, what is considered to be one of our military's biggest defeats ever, was at the battlefield of Little Big Horn. Everyone knows battlefields are prime locations for hauntings. What with all the death, fear, and sadness that comes from fighting. So what is the last thing you should probably do with a battlefield? Harvest the bloodsoaked stone and build a house from it. It seems the spirits of the battlefield also go where the stone goes. Considering the soldiers from the Battle of Little Big Horn where scalped, stripped and mutilated in various ways it is not surprising that their haunting runs pretty deep. Lizzie Borden House, Springfield, Mass. she gave her father 41." Now you can visit the house where she put her family on the chopping black! The Lizzie Bordon house is not just home to ghost tours of all kinds, but hosts plays and reimagining's of the event and even a few small horror conventions. Needless to say it is the most popular attraction of Springfield, Massachusetts. Thrill seekers head there nowadays fueled by claims that people have seen bed sheets get rumpled in front of them, indentations of a body in mattresses and pillows, and sightings of a headless man that they believe is Mr. Borden, considering he was buried a head shorter than he should have been. For those who like to see dead presidents on more than just money, the White House has a few of them floating around apparently. 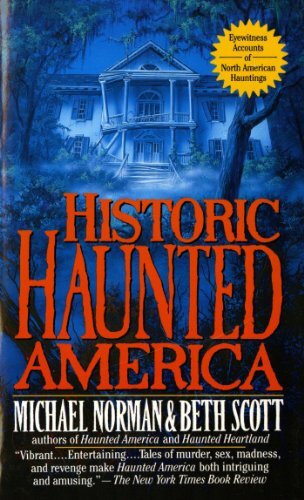 Presidents Andrew Jackson and, more famously, Abraham Lincoln, drift through the hallways of the White House, and so does a ghost who hangs laundry—even now that washing machines have been put in. All references to the ghost stories were removed from the official Web site after the Obamas moved in, perhaps they didn't want to scare their kids. I guess they wanted to get away from all the ghost stories and stop people from wandering off the tour in search of them. This doesn't mean you still can't go inside and take a peek, you just have to stay with the tour. Hi--I enjoyed your article. As you know most people who consider themselves objective individuals scoff at the idea of ghosts but what do we really know about phenomenon outside our ordinary reality? It may be that what we think are ghosts are images or sounds from another dimension or even another time? Lots of fun to think about so two thumbs up and a rating for U.